The first three verses of this chapter are a continuation of the prophecy started in 11:1. Most scholars feel these verses should have been part of chapter 11, since its part of the same event. The first three verses deal with the last half of tribulation, and merge into the Millennium of blessing and touch on the great white throne judgment and eternity. The last ten verses fill in some very specific details and events to close of seven-year tribulation period. At that time: The flow of time is a continuation of the events occurring in chapter11:36 to 45. At the close of verse 45, the Antichrist has enteredIsrael and is about to desecrate the Temple. This event as noted earlier in chapter 11 is the mid-point of the tribulation period occurring 3 ½ years into the seven-year agreement. At this point, the Antichrist will proclaim he is god, and demand the whole Earth to worship him. Israel rejects his claim, and turns toward Jesus Christ as their Messiah. This turn is the result of the ministry of the two witnesses, one being Elijah and the other either Moses or Enoch. They according to Revelation 11:3,10, from Jerusalem unleash God’s judgments on the world, turning the world against them, causing the Antichrist to attack Jerusalem and silence their work. The Antichrist stops sacrifice at the Temple, and engages the two witnesses in what seems to be battle. 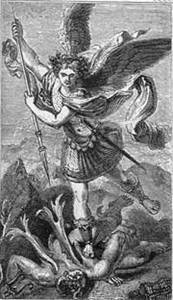 Michael: The angel Michael is reintroduced here, the first mention of him in the bible occurred in Daniel chapter 10, where he helped the current angel speaking with Daniel, resist the demonic, “Prince of Persia” who tried to prevent Daniel from receiving this message. (Daniel 10:13,21). We again see him, now intervening on Israel behalf at the middle of tribulation period. Revelation 12, also corresponds with events taking place on earth, revealing the spiritual events in the heavenly realms. Michael and his angels are finally permitted to engage Satan and his angels, who up to this period, had access to Heaven to accuse God’s servants on earth. At the mid-point this access ceases, and Satan and his forces sent to earth where Satan will make his last stand in the person of the Beast or Antichrist. Upon being cast to Earth, Satan making his last and final stand before the close of this age attempts to destroy Israel, hoping to thwart God’s will. Time of trouble: This is a unique period, unlike any period in the history of the world. The period is called the time of Jacob’s trouble (Jeremiah 30:6). At this moment, it seems like Israel is finally destroyed and Satan, who now incarnates the Antichrist is victorious. Never….since…nation: This period is tied to the event known as the “Abomination of Desolation”. Jesus specifically references Daniel, about this event at the end of time. Antiochus IV Epiphanes, 167 years before Jesus, desolated the Temple as prophesied in (Daniel 8:12,11:31) by setting up an image in the Temple. Jesus 200 years later, reference a future Temple desolation as a signal to flee the city of Jerusalem, as an unparalleled destruction is about to fall on the Earth. 14 “And this gospel of the kingdom will be preached in all the world as a witness to all the nations, and then the end will come. 15 “Therefore when you see the ‘abomination of desolation,’ spoken of by Daniel the prophet, standing in the holy place” (whoever reads, let him understand), 16 “then let those who are in Judea flee to the mountains. There are several important points to understand here, Jesus by referencing Daniel affirms the book of Daniel as inspired. Jesus also affirms the need for a Third Temple, by linking “The end” with the abomination of desolation. Jesus tells us what follows the Abomination of Desolation, is unique and unparalled in humanity, from man’s creation until the end of time, reiterating this period as the same being reference here in Daniel 12:1. People delivered: This is the final phase of Israel’s humiliation in the eyes of the world, at this point Israel is on its way for its full restoration and blessing in the Millennial age. Obedient Israel, will reject the Antichrist and his claims to self deification. Israel will finally understand, Jesus was the Messiah, he came and suffered for the sins of humanity (Isaiah 52:13-53:12). When Israel cries out to Jesus, he will return as promised, before he was crucified, but not until Israel recognizes Him as their Messiah. Many of those: What event follows this horrendous period of judgment on the world? What follows is a period of blessing and reward. Outside of the Temple mount, on the Mount of Olives is a Jewish cemetery facing the Temple. The hope those being buried there is the resurrection, to see the Messiah at the resurrection when Messiah kingdom is established. The resurrection has two parts, a resurrection of the just and a resurrection of the unjust. The timing of these two parts has caused great debate and division. Who is resurrected? Moreover, when? 1. At the end of time there is one resurrection of the just and unjust, known as the “General resurrection” a view held by AMillennialists and post-millennialist. 2. There are two distinct resurrections, the resurrection of the saved, and the unsaved. The first resurrection takes place before the Millennium and the second, of the unsaved, takes place after the millennium. This view often held by pre-millennialists. 3. Under the Pre-millennial heading, there are three view of when the rapture occurs, the first resurrection. a. Pre-tribulation: The first resurrection takes place in two phases, the first phase when the when the church is raptured before the tribulation, and the second phase when the saints killed during the tribulation are resurrected to rule and reign with Christ for 1000-years. (I Thes 4;13, Revelation 20:4). In addition, many commentators view the Old Testament saints, such as Daniel being part of the second phase of the first resurrection, when the Jewish saints killed in the tribulation are resurrected following the return of Messiah. b. Mid-tribulation: The resurrection occurs at the middle of the tribulation period, followed by second resurrection at the end of the tribulation for saints killed during the last half. c.post-tribulation: Immediately after the tribulation (Matthew 24:30), before Christ returns the saints are resurrected to return with Christ and establish the Millennial kingdom. Everlasting life: Here we see a distinction between two groups of people, the wicked and the wise. Both groups referred to earlier will be resurrected, with different results. The wise will have everlasting life serving the kingdom of Messiah. The resurrection was event mentioned several times in the Old Testament. (Job 19:25-27, Isaiah 26:19). The distinction between the two phases and groups resurrected is not made till later, upholding the principle of greater revelation built on earlier revelations. Similar to the prophecy regarding Messiah, the seed of the women (Gen. 3:15), greater revelation is built on earlier revelation. Jesus reinforces the dual nature of resurrection for the just and unjust. Everlasting contempt: In the book of Revelation, we are given a greater revelation of God’s plan of resurrection. According to Revelation, following a one-thousand year period of time, the Millennium, all those not part of the first resurrection are resurrected to give an account of their works, done in their body. They are sent to theLake of fire, for the rest of eternity, apart from God, bearing their shame (Revelation 20:13-15). Those who are wise: Daniel brings hopes to those in tribulation with the promise of reward for the righteous. Daniel, going back to Antiochus IV, separates humanity into two groups, the wise and the wicked. The wicked are not aware of what awaits, them the wise are and will be rewarded for a faithful life in spite of death and suffering in this life at the hands of the wicked. Turn many to righteousness: All who the saved, resurrected following the return of Christ will be part of His Millennial Kingdom. However, there will be degrees of reward based on faithfulness of the life lived in the body. Those who were obedient will be given a greater responsibility in the Millennium. The parable of the talents and mina, Matthew 25:14-30 and Luke 19:11-27 are directly related to the Millennium. Jesus in Luke, refers to the servant who took his masters 5 mina and made another 5 mina. The master, who went to claim a kingdom, give the responsible servant charge of 10 cities based on his service in his absence. Stars: Just as there are earthly stars, their will be heavenly stars. Those who serve faithfully and turn many to righteousness will be the stars of God’s kingdom. Shining out, in contrast to others for the rest of eternity. Shut up the words: The angel now instructs Daniel, stop the book, the book of Daniel is intended for an end time audience. The book would closed to understanding until the time of the end. Today, as Israel is restored and the world is in conflict around Jerusalem, the words of Daniel become clear. The seal of understand the words are being removed as we approach the events talked about by the prophet Daniel. Many: Some this man who run as the prophecy about the increase in transportation in the end, the speed of transit, running here and there. Others view this as man’s quest for understanding, searching here and there. Knowledge: There are two views of this prophecy as referring to general knowledge or prophetic knowledge. The Hebrew word, t[dDa`ath is translated knowledge, perception, skill. Human knowledge has increased, only to cause man to turn from God and make himself an idol. This human idolatry is ultimately realized in the Antichrist, who exalts himself. Stood two others: Again, we are back to the scene in Chapter 10, Daniel is by the river Tigress, with two additional angels. At this point there are either 3 to 4 individuals in addition to Daniel. The message just received, Daniel 11:1 to 12;3 was given to Daniel by the angel who along with Michael resisted the “Prince of Persia”. Daniel now is alerted to two additional angels, on both sides of the river. They themselves, are perplexed by the prophecy just delivered to Daniel. One said: one of the two, asked the “Man clothed in linen”, he is the one first seen by Daniel at the start of chapter 10, which caused Daniel to fall, face first into a deep sleep (Dan. 10:5,6). This is more then likely a Christophany, an appearance of Christ in the Old Testament. How long: The angels ask the question, which shed light on the timing of the events of this prophecy and its fulfillment. Here we are given specific timing of events which corresponds to events leading to the completion of the time determined on Daniel’s people and city (Daniel 9:24-27). Time, times and half a time: The “Man clothed in linen” responds, with the phrase used in Daniel 7:25 and Revelation 12:14, meaning; time: one year times: two yearshalf a time: ½ year. This equals 3 ½ years. This corresponds to the second half of the tribulation period, 42 months or 1260 days. The man is telling the two angels, at the conclusion of the 3 ½ years, when Israel’s own power is completely shatteredprophecy will be accomplished. I did not understand: The understand of this prophecy was sealed to Daniel for the time. At this time the Temple was not even rebuilt from the Babylonian destruction in 586 B.C. 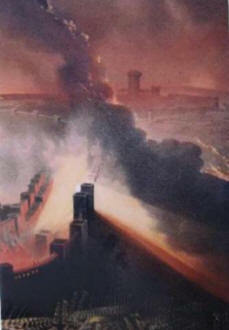 The Temple and the city of Jerusalem needed to be rebuilt and destroyed again. 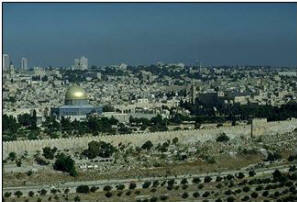 Israel would then be scattered over a period of time, then the Temple would need to be rebuilt again. Today, we understand how all these events fit into God’s plan. Even a hundred years ago, much of what we understand about Daniel is now becoming more clear. Closed up and sealed: Daniel, instructed to depart, by the “Man clothed in linen”, lets Daniel understand the message is not for him to completely understand now. The message is for an end times audience. Till the time: This message of Daniel will be understood in the time of end. For this reason, Daniel is hard to understand for those who are not at the time of end. Again, only after Israel was restored, fulfilling end time prophecy, and the movement for rebuilding the Temple do we see how the events fit into the End time events. Daniel is an end times book for an end times audience. The words in Daniel apply to all generations, but its complete understand will be left to the time of the end. Many purified: The purpose of this process in time is to distinguish between two groups of people, the wicked and the righteous. The process of life and tribulation, polishes the righteous who understand, while the same time the wicked are exposed and don’t understand. Wise shall: Understanding Daniel, and living righteously is a sign of wisdom, as opposed to wickedness. The wicked are not aware of their judgment until its too late, the righteous are purified in the process of life. Time …daily sacrifice: The start of the second half of the tribulation begins with the stopping of the sacrifice by the Antichrist. After he confronts the two witnesses inJerusalem, the sacrifice is stopped. A battle ensues over the next 30 days, where the resurrected Antichrist, now incarnated by Satan, kills the two witnesses and constructs an image in the Temple of himself. He declares himself god and demands worship, by those on Earth. Abomination of desolation: Like his predecessor, Antiochus IV Epiphenes, the Antichrist will also desolate the third Temple. An image of him will be set up, and all will be demanded to worship this image. Communist systems, are great example of the natural progression of atheism. The same system which disavow the worship of God, replace God worship with man worship. Lenin, for example was kept in a refrigerated coffin, so countless generations to come could look on his dead body. Huge statues and images of leaders are constructed, the worship of God is replaced by the worship of personality cult. This is ultimately manifest in the end times, as the final world leader makes himself the focus of all religious attention. 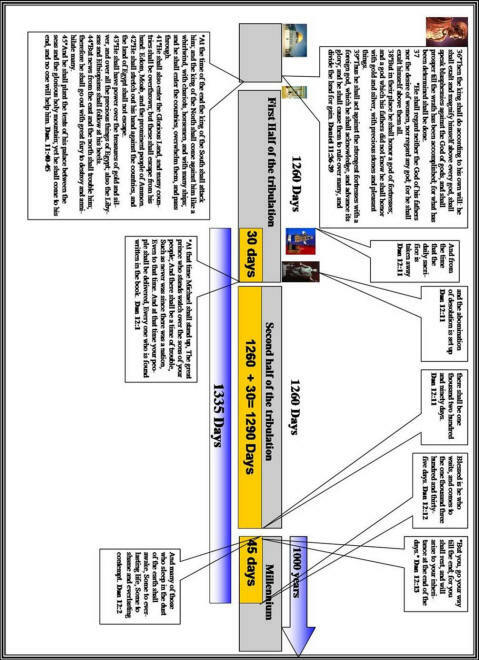 1290 days: The 1260 days of the 2nd half of the tribulation, plus 30 days of the first half of the tribulation equal 1290 days. The mid-point begins with the stopping of sacrifice and construction of an image the Temple. This period takes 30 days, followed by the 2nd half of Daniel’s 70th week, 1260 days, 3 ½ years, 42 months or a “Time, Times and ½ a Time” is 1290 days. Blessed is he comes: When Christ returns, he will judge the nations. All the wicked will not die at Armageddon. However, most of those on the earth at the start of the tribulation period, die in the tribulation a certain percentage, survive the tribulation and are alive when Christ returns. The determination of who enters the Millennium from those who survive the tribulation is seen in the judgment of the ‘Goats and Sheep’ Matthew 25:31-46. 31 “When the Son of Man comes in His glory, and all the holy angels with Him, then He will sit on the throne of His glory. 32 “All the nations will be gathered before Him, and He will separate them one from another, as a shepherd divides his sheep from the goats. 33 “And He will set the sheep on His right hand, but the goats on the left. Only the sheep will enter the Millennium, the just survivors on the earth. They along with the remnant of Israel preserved by God will repopulate the Earth. The saints, Old Testament and New Testament will rule and administer the Kingdom of Messiah. For example the Disciples will rule and judge Israel in the Millennium as the nation becomes the chief nation on earth. For someone who survives the Tribulation period where most on the earth die, and then is found just enough to enter the Millennium the will be blessed. 1335 days: The transition from the old order to the new order will take 45 days. During this period several events will take place. you shall rest: Daniel will die, but his death is only temporary. He is promised resurrection and inheritance in the kingdom to come. your inheritance: Daniel will receive his reward and established in the coming kingdom. end of days: the final days of the world as we know it. Leading to thekingdom of Messiah, where Daniel will rule as judge along with the New and Old Testament saints. This entry was posted in Discipleship and tagged Bible, God, Jesus Christ, Old Testament, revelation, The Book of Daniel. Bookmark the permalink.